Composite veneers are used to improve the colour, shape and size of teeth to make them more aesthetically pleasing. They can be used to fix minor chips and cracks in teeth. They are different from porcelain veneers in that they require little if any tooth reduction (drilling) and the treatment can be completed in a single visit. However, unlike porcelain veneers, composite veneers can be prone to staining and may not last as long. To create composite veneers, composite material is applied to the front surfaces of the teeth and sculpted to the desired shape and finish under the hands of an experienced cosmetic dentist. What are composite veneers used for? Crooked teeth – If your teeth are crooked, an ideal way to achieve a straight white smile would be to undergo rapid orthodontic treatment with something like the Inman Aligner, Six Month Smiles® or Invisalign®, followed by teeth whitening and composite veneers. Stained teeth – When there are undesirable stains, white patches, and/or discolouration of the teeth which cannot be treated with a dental clean or teeth whitening alone, then composite veneers are an ideal solution. Damaged teeth – When your teeth have been damaged by acid erosion (via bulimia or things such as fizzy soft drinks) or chipped by accident, composite veneers (cosmetic bonding) are often the most ideal, minimally invasive and cost-effective solution. Closing gaps between teeth – One of the most common cosmetic complaints that composite bonding is used for is to close gaps between the front teeth (diastema) or between other teeth. This treatment can be completed in a single visit and is a very cost-effective alternative to orthodontic treatment or porcelain veneers. This depends on many factors; the type of composite material used (there is a big difference in the quality of different composite materials), the aftercare and habits of the patient (i.e. if the patient continued to drink a lot of fizzy drinks or grind their teeth then this would reduce their longevity). On average, Composite veneers can last between 2 – 5 years. 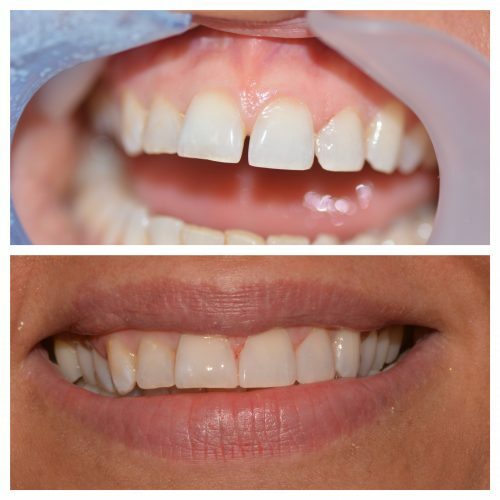 What are the alternatives to Composite veneers? This depends on the underlying cosmetic complaint, but in general, alternatives would include porcelain restorations such as veneers and crowns or orthodontic treatments to close gaps and straighten crooked teeth. During a consultation, you will be able to discuss all the possible options that are available to you as well as the advantages and disadvantages of each option.